Altbier in Dusseldorf plus more stuff! üsseldorf has one amazing thing to offer the beer world, and that magical thing is Altbier. It's a strange beer style and it's amazing it has managed to survive at all amid a tide of pils, but survive it has and it seems to be undergoing a renaissance with adverts for it everywhere in the city and the traditional brewpubs full almost continuously. The main problem is that Altbier is not a protected style as is Kölsch and so it's okay for brewers to make it miles away then ship it in and still call it Alt. The best places to drink it is at the "small four" brewpubs in the city centre which produce Altbier, all worth sampling vom fass (from the barrel), but it's the serving method which may surprise you; most pubs serve one beer, the alt, in 20 or 25cl "highball"-like glasses which, obviously, don't last long hence the roving waiters who carry trays of full glasses and will usually replace your empty glass without asking unless you manage to persuade them otherwise. Alternatively, if the waiter is feeling talkative, you may be asked a simple "Ein?" (or the number in your group) to ascertain how many glasses of alt are required. Altbier is top-fermented - consequently a very rare beast indeed in Germany - and bears strong similarities to Kölsch from nearby Köln although, with it's dark malts, Alt is a far more interesting drink. 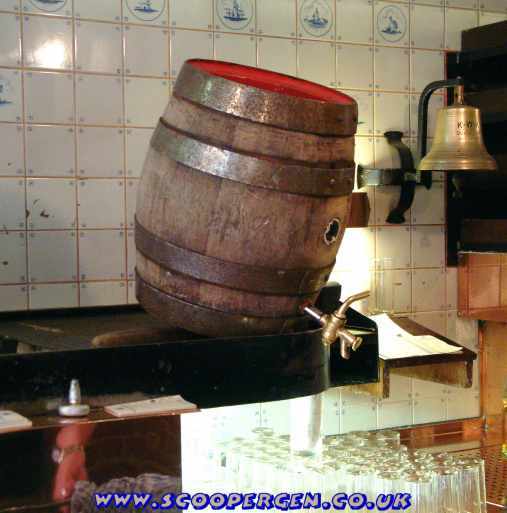 After fermentation it is lagered for a short while (2 to 4 weeks) before being served, in the traditional pubs at least, from a wooden cask although the beer isn't cask conditioned and seems to have been "bright-racked" into the casks with added Co2. So, an interesting hybrid beer, and one which I have an increased respect and desire for, particularly as I write this thinking back a week! It's great for a session, and the little "tick marks" on your beermat (the waiters will mark your beermat each time you get a glass of beer) add up scarily fast. Food-wise you're spoilt for choice with plenty of Schweinshaxe (roasted pig's leg) and Rheinland Sauerbraten (marinated beef or horse pot-roasted with red wine vinegar and spices) plus Himmel und Ähd ("Heaven and Earth") which is black pudding with potatoes, onions and apple sauce! Kartoffelklöße is a steamed potato dumpling, Kartoffelpüree is mashed potato, Bratkartoffeln fried potatoes, Röstkartoffeln roast potatoes, Gemüse is vegetables (rare in Germany!) and Kräuterquark is a local soft, herby cheese. There are some other "Altbiers" you might encounter so here's the gen as I understand it, just don't expect any of them to be very good! Hansa is another from DAB. 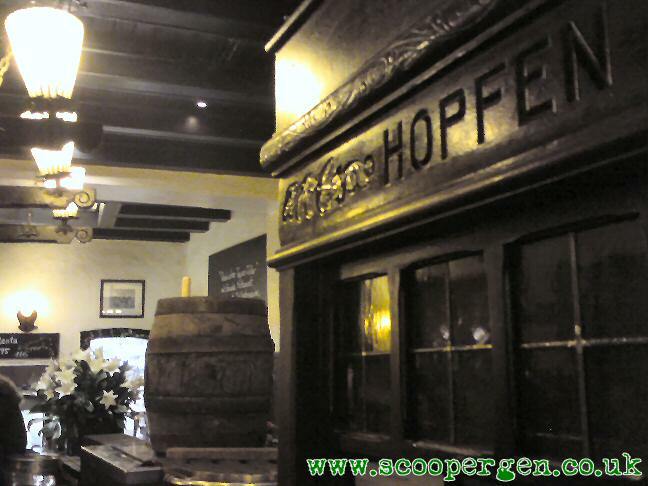 Below, I will list the brewpubs and bars in Düsseldorf and around in my usual style...! Near the U-Bahn stop Oststraße, go up to Oststraße itself from the northern exits (the front if heading north from the hauptbahnhof) and head left, the brewpub is a couple of blocks on your right-hand side. Traditional beerhall with beer directly from the wooden cask and the small tower brewery out the back. 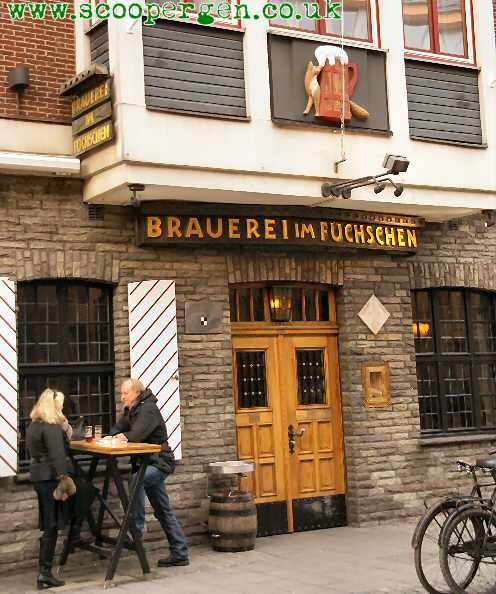 It’s the only one of the "old-wave" hausbrauerei to be outside the Altstadt, although you can get Schumacher Alt at Im Goldenen Kessel (golden kettle), opposite Zum Schlüssel, but for the proper experience go to the brewpub. The food is excellent, especially the beef in altbier, and here you also get the very rare chance to sample Jungbier which is a lighter (3%) and very worty version of Alt. Make the trip from the Altstadt here, you won't regret it, despite the beer being (in my opinion) the least interesting of the four traditional breweries in town (but it's still decent enough!). Latzenbier is available on the 3rd Thursday in March, September and November. To reach Albrecht, alight from tram U70, U74, U75, U76 or U77 at Belsenplatz (see Alter Bahnhof below) and take the 833 bus (Belsenplatz-Dominikus Krankenhaus) from the stop on the corner of Quirinstraße (see my Google map). Alight at Heinsbergstraße (just after a garage) then follow the road for 50 metres and the brewpub is on your right in the grounds of the Schmittmann distillery. This brewpub, part of a chain, is over the Rhein from the Altstadt in the suburb of Oberkassel, easily reached by the underground trams (the ones prefixed U) which brought you to Heinrich Heine Allee station. Don't expect anything amazing but, on our visit, the beers were decent and the snacks just what we needed. Two permanent beers, kupfer and messing, plus a seasonal. Gulasch-Bräu, Alter Bahnhof, Belsenplatz 2, Oberkassel. ( ). Open 10:00-01:00 daily. Take any of the trams U70, U74, U75, U76 or U77 to Belsenplatz and the brewpub is in the old station opposite the stop. The shiny copper kit is now back in production after a six-year break. 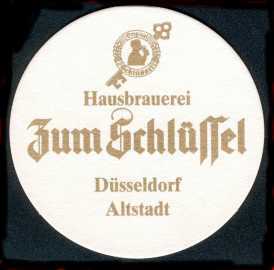 It was at one time owned by the Gatzweiler family (of Gatz Alt fame) but was sold on with the brewery to Hannen who were then bought by Carlsberg. When Carlsberg sold Hannen to Öttinger it was sold on to another local owner but he soon sold it off and the pub stopped brewing in 2004. The single beer (plus Schumacher Alt) is served from oak casks on the bar and is pretty decent. From Bolkerstraße, turn left into Hunsrückenstraße and follow the street north. It changes name to Neubrückstraße and, after a slight shimmy, you arrive at the junction of Ratingerstraße. Turn right and the brewpub is on your left almost immediately. A long, brown wood-panelled bar leads back into several large tiled rooms, slightly out of the tourist zone and so you'll be drinking with locals rather than visitors. This brewpub (brewery out the back as usual) does food and beer to die for and is the other essential visit in town. 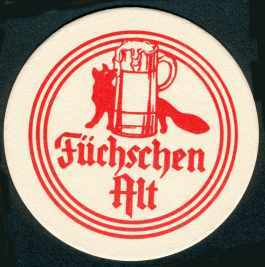 They also brew a wheat beer - Silber Füchschen - but it’s the Alt that the customers come for, and superb it is too. 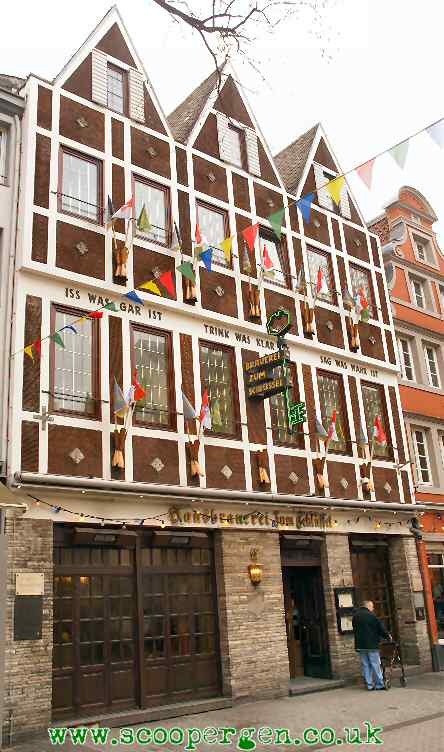 You'd never guess the building is post-war such is the antique feel and lived-in atmosphere but it is, and a meal of boiled ox plus a load of altbier in the Little Foxes must rank as one of life's better experiences. If you like munching on a pig's leg - and, let's face it, who doesn't? - then you're in luck as the German speciality Schweinhaxe reaches near perfection here. Take the Bolkerstraße exit from the Heinrich Heine Allee Underground tram station, note the surface tram stations are one-way and in different streets! The bar is on the left hand side of the road opposite the Golden Kessel (see below) and fairly obvious. Owned by the Gatzweiler family who sold off their regional brewery a few years back (it was soon closed by Carlsberg) but Zum Schlüssel (the key) is still brewing. 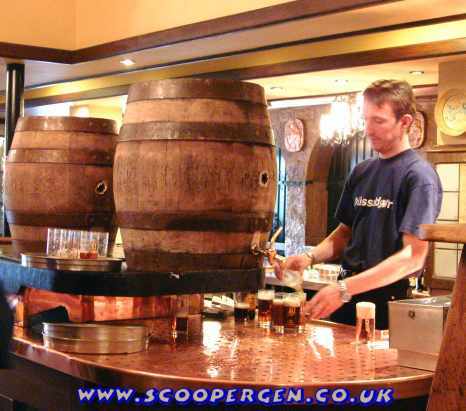 A traditional beerhall with the malty beer served from wooden casks whilst the brewery can be seen at the back. Their "Stike" beer is available on the last Wednesday of March and October. Find Marktplatz and turn left into Marktstraße. Zum Uerige is on the right, on the corner of Bergerstraße by the tourist information office. Felt by many to be the classic Altbier brauhaus, this amazing old building is full of corridors, rooms, and snugs – a scene from the first series of "Auf Wiedersehen, pet" was apparently filmed in the back room! The beer is the hoppiest of the lot and takes a few glasses to get used to, plus they also brew a very bitter, strange wheat beer. 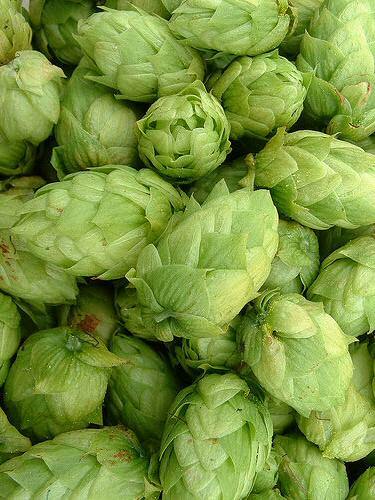 Probably the city's essential visit and definitely the hoppiest altbier! Try and get into the strange little curved "compo" by the bar and watch the story unfold... No proper food as such but snacks are frequently circulating including rissoles and raw steak open sandwiches. You can also get bottled Alt in an "unfiltered" state if you ask... maybe! Sticke (the stronger beer) is available on the third Tuesday in January and October whilst Doppelsticke is made exclusively for the USA but can sometimes be bought from the Stickum bar on-site. Uerige also have a strange little bar in the basement of the Carsch-Haus department store at Heinrich-Heine-Platz 1 which sells the beer vom fass from oak and also the unfiltered beer in bottle - a reason to visit if nothing else (we didn't have time). Trams 703,704,712,713 to Pempelforter Straße and the bar is within staggering distance of the platforms! 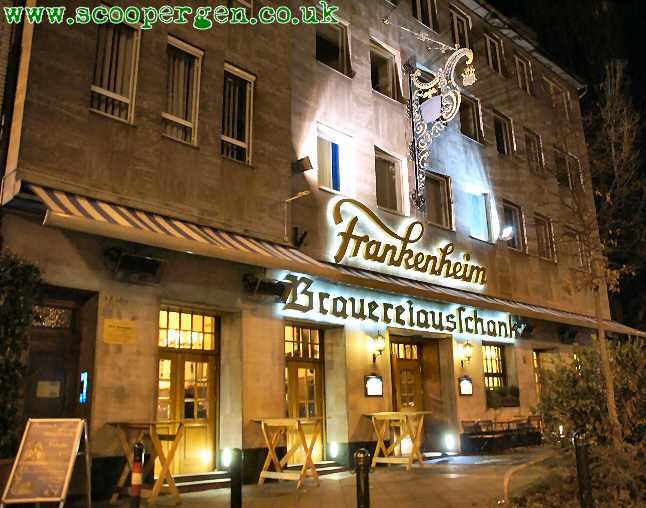 The Frankenheim brewery moved out to the suburb of Neuss back in 1991 but is still nominally based here and it's a beautiful old bar, too, with their (sadly cheap-tasting) beer on gravity from a metal cask. If you can get a place in the tiny room behind the right-hand bar you get a superb view of goings on below. The brewery is now part of the Warsteiner group which explains the blandness... and don't order the Blue unless you want Altbier mixed with cola! Find Zum Schlüssel and this bar is ten metres further along the street on the opposite side. This lovely old bar is the city-centre tap of the Schumacher brewery and serves their excellent beer straight from the wooden cask (Jung from tap). A visit to the brewpub on Oststraße (see above) is recommended too, if only for the Jungbier and superb food. Schalander, Kölner Landstraße 247. Open daily 17:00-01:00, 02:00 Fri & Sat. Take U74, U77, tram 701 or 713 to Ickerswarder Straße and the bar is very close to the stop, although it's a fair way out to the south of the city. We didn't get chance to visit although it sounds decent with 3 local Alts on plus other brews, 13 beers on tap in all which is extremely rare for Germany. They have Füchschen, Uerige, Schumacher and Frankenheim altbiers on tap! An easy trip out of Düsseldorf courtesy of tram 712 from the city centre (which, mainly on weekdays, is still operated by vintage articulated 1970's Düwags), here you can scoop another Altbier at the town's own brewpub plus see the attractive centre which escaped wartime destruction and is consequently worth a look. There are also tied houses for some of the city's altbier brewpubs making a trip out here very worthwhile! You can also catch S6 to Ratingen Ost, not far from the brewpub. Take tram 712 to it's terminus. Follow the people onto the main street and head straight through the centre, past the big church and bars, until you see Bahnstraße on your right. Follow the road for a few hundred metres and the bar is on your left. You could also catch S6 from the Hauptbahnhof to Ratingen's Ostbahnhof and the brewpub is a few hundred metres into town on your right. Very popular and busy, so much so we had to perch on a tiny shelf to sample the bar's single beer, an alt, served from metal casks. The food looked very nice indeed but we were unable to try any... and the beer was sadly fairly average. Zu den Drei Königen, Düsseldorfer Straße 1. Open daily from 11:00, 10:00 Sundays. Follow the above directions and you'll pass the bar on your right just before the main square (which isn't that big) and church. A Schlüssel pub which seemed to serve the altbier vom fass in relaxed, fairly plain surroundings. Just a few metres past the Drei Königen, opposite the church. 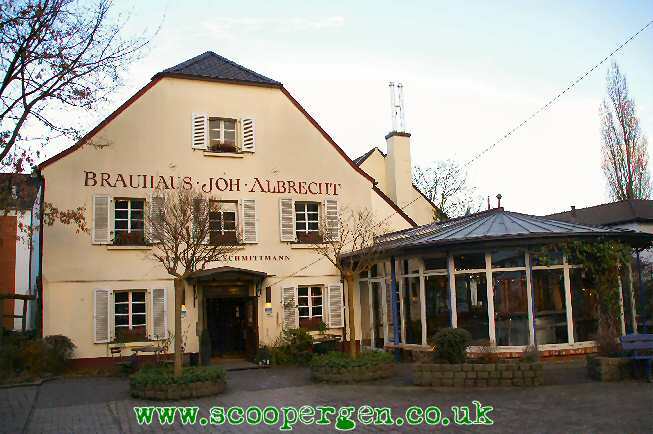 Opposite the church in a superb old black and white building, this cosy and sociable bar serves cheap yet very high quality food with Uerige altbier vom faß to wash it down. Highly recommended. Trains S1, RE1, RE6, RE11 all go from Düsseldorf to this town close to Dortmund with a very concretey centre presumably thanks to wartime bombing. Stammhaus Fiege, Bongardstraße 23. Open Mon to Sat from 11:00, closed Sun. Right in the centre of town by the very few old buildings left. Take tram 317 to Rathaus and it's a short distance along the main street around the right-hand bend by a big church. The official tap of the large Moritz Fiege brewery seen just outside the hauptbahnhof, this is a well-done little bar full of brewing bits and pieces plus a superb stained glass window depicting the city ruled by church and industry. Duisburg is a short train ride away from Düsseldorf via S1, RE1, RE3, RE5, RE6 or RE11 or even, if you've a lot of time and bladder the size of a cow's, U79. There's plenty of old industrial heritage around here plus you can get to Mulheim via one of the region's excellent inter-urban trams, No.901. Finkenkrug, Sternbuschweg 71-73. Open 12:00-01:00 Mon-Thu, 12:00-03:00 Fri, 17:00-03:00 Sat, 11:00-01:00 Sun. Take tram 901 to Schweizer Straße then follow Sternbuschweg south for 3 junctions and the bar should be there. Tram 901 is an inter-regional line which links Mulheim and Duisburg. Very unusual bar with well over a dozen beers on tap plus many more in bottle. 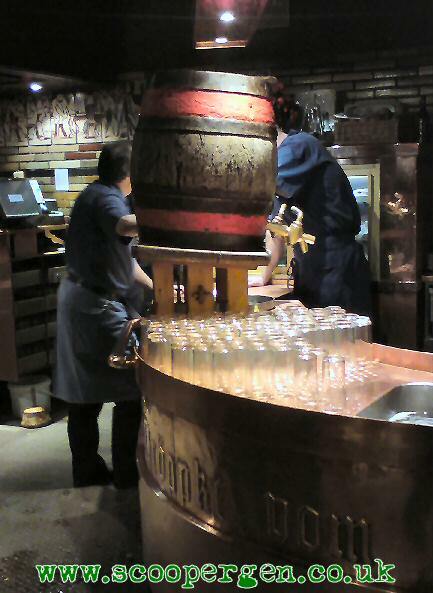 It has a guest beer tap and some of the bottles could be scoops especially the stronger beers such as Schorsch Bräu. We didn't have time to check it out but it sounds good, reports please! Their slogan is "222 types of beer, 1 bar" which is about as un-German as you can get! Brauhaus Schacht 4/8, Düsseldorferstraße 21. Open from 11:00 until late daily. Any tram or U-bahn to König-Heinrich-Platz then use the western exit. 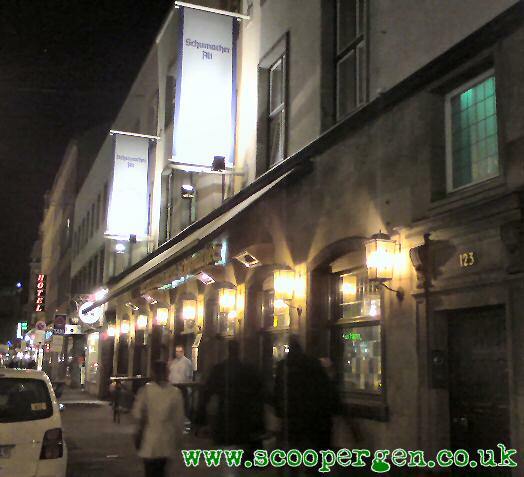 Follow the pedestrianised street south and the brewpub is on this street in an large old building when it turns wide. Webster-Brauhaus, Dellplatz 14. Open Mon-Sat from 12:00, Sun from 10:30. A short walk southwest of Schacht, head south onto Freidrich-Wilhelmstraße, turn right, then first left into Wallstraße. After a hundred metres the road opens out and you'll see a church to your right, the brewpub is opposite this on your right. This brewpub has been here 20 years and the beers are of decent quality, plus they do more adventurous seasonals than are the norm. The food looked good, especially the flammkuchen. A former industrial powerhouse living in hard times, Essen has a brewpub plus a rare beer shop, but it's the industrial monuments which are more interesting especially the Zeche Zollverein mine and coking works. Take inter-regional tram 107 to Zollverein where, if you like industrial monuments, you'll be in your element. Trains RE1, RE11 and S1 or S6 all go from Düsseldorf. brewpub in S of city, tram 101/107 or U11 to Martinstraße. Take the forwards exit (if travelling south), walk along the main road and Girardetstraße is on your left after 300 metres or so with the brewpub set back down a slope on the right after a short distance. Drinks of the World, Altenessener Straße 548. Open Mon-Fri 07:00-20.00, Sat 10.00-18.00. U17 to II.Schichtstraße, the first station as the tram comes overground, and the shop should be close to the station. Yet another ex-industrial town, this time near Bochum and Essen. The brewpub is very close to the station although frustrating to find... it's not really a town for holidaymakers! Hibernia, Bahnhofsvorplatz 2. Open from 09:00 to midnight daily. Part of the same chain as Schacht and Zeche Jacobi and serving the same range of beers - maybe brewed here, maybe not, who knows? It's also known as the Wulfertbrauhaus. We didn't have time to visit, but there are several beery options if you do. RE10 or trams U70 / U76 all go here. Gleumes, Sternstraße 12. Closes 14:30–17:00 on weekdays and 15:00-17:00 Sat, closed Sunday. Tram 44 to Freidrichsplatz, the pub is just north of this. 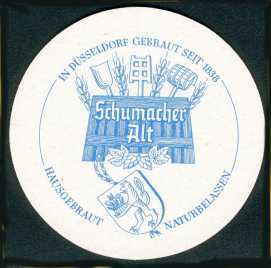 Small brewery with attached Ausschank, or tap, which closes in the afternoon. Also, two micros – Falke and Königshof – no known taps. Walk north from Gleumes along Sternstraße until you reach Weggenhofstraße, turn right, and it should be just along here. Beer shop with lots of German brews. Dachsbau, Hubertusstraße 79-81. Open from 17:00. Situated one block west of Westwall. Bar with good tap range of 18 beers which is rare for Germany. Sounds worth a look. Suburb of Düsseldorf and home to Frankenheim Alt plus another brewpub. Easy to reach by tram, U75 and 709 both go there as do trains RB4 and RB13. Im Dom, Michaelstraße 75. Open 11.00-14.30, 17.00-23.00 daily except Sundays. Tram 709 to Landestheater, take Zollstraße south then turn right into Michaelstraße. Beers are more interesting than many brewpubs and include an Alt. It's close to Markt in the centre of town. 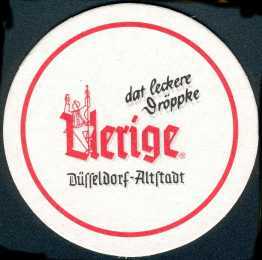 Interestingly, they refer to themselves as an "Obergärige" brewpub - top fermenting - and all beers are brewed in that manner, very rare in Germany! Another ex-industrial town, basically an extension of Mulheim, with a shared-operation tramway on line 112. Another claim to fame is a massive gas tower, situated next to the CentreO site where the brewpub is located. Zeche Jacobi, Promenade 30, CentrO. Take tram 112 to Neue Mitte and you can't miss the CentrO place! The brewpub is apparently in one of the cabin-type things by the lake. Part of an old steelworks, now a temple to capitalism, we had a look from the tram and decided against visiting as it all looked a bit crappy, we were running late and it's part of the same chain as Schacht in Duisburg and Hibernia in Gelsenkirchen. One of only three trolleybus systems in Germany and close to Düsseldorf. Walder Bräu (Al B'Andy), Augustinerstraße 1. Bus 682 to Obere Weyerstraße. In the north-western suburb of Wald, this brewpub looks fairly difficult to get to by public transport! Famous for it's suspended monorail, the Schwebebahn, which is currently suspended until May 2010 for engineering work... the main reason we didn't visit! Wuppertaler Brauhaus, Kleine Flurststraße 5. Schwebenbahn stop “Werther Brücke” or DB Wuppertal-Barmen. In centre by the Rathaus. Apparently a good beer range for a supermarket.